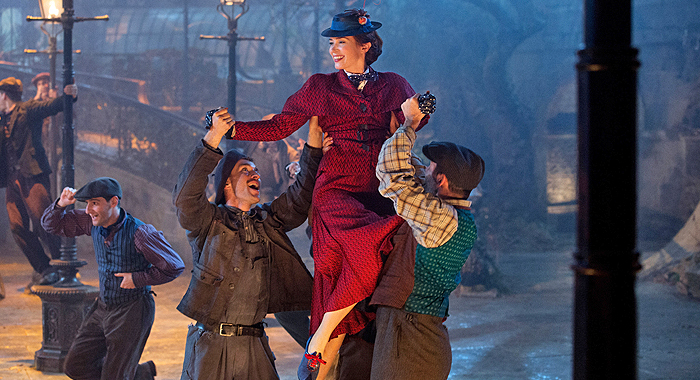 Mary Poppins has returned to shake up the awards landscape, and it may just pull off an upset or two. 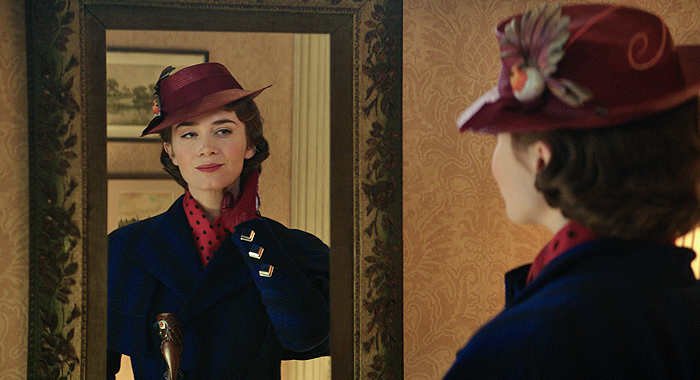 This month, Mary Poppins Returns has the Herculean task of recapturing the magic and music of the beloved original. Not possible, right? Well, according to many of the critics and industry folks who saw it at last week’s premiere, it might just come close. Early social reactions saw the majority of critics praising the film and Emily Blunt in particular, for her turn in the iconic blue coat. 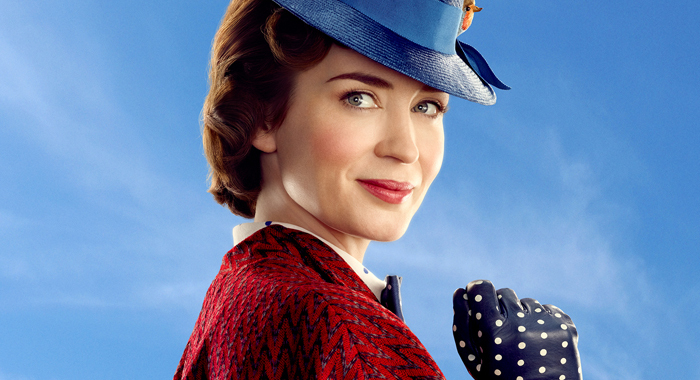 Germain Lussier of i09 was typical of the praise thrown her way and the movie’s way when he tweeted: “Mary Poppins Returns is an exquisitely made film with delightful music, excellent performances (especially by Emily Blunt) & contagious optimism.” But, could the movie – like its predecessor – be an Oscar contender? 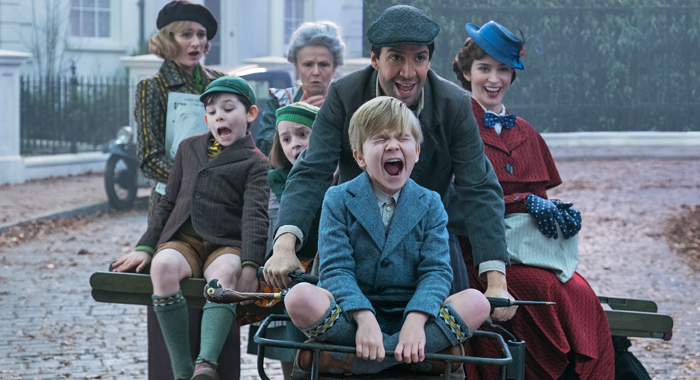 As we enter December, with Golden Globe nominations just days away and Oscar ballots almost on their way to voters, let’s take a look at the competitive awards categories for Mary Poppins Returns and why this unlikely late-season entry could just shake things up. We hate the “thing we need right now” hot-take framing as much as you do, but in this case, there’s some truth to it. 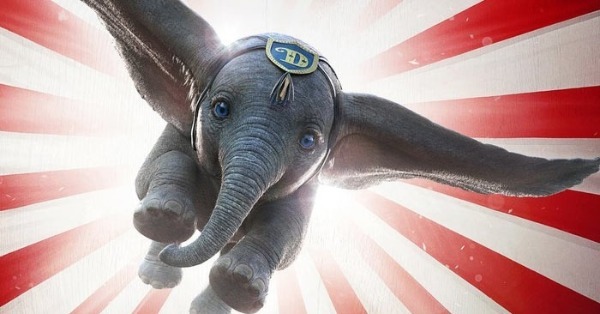 Like a high-flying kite – scratch that: a balloon – Mary Poppins Returns has brought a huge dollop of joy to a pretty dour awards-season field. Of all the major contenders – think Roma, If Beale Street Could Talk, Vice, The Favourite, or Green Book – Poppins is the most unapologetically joyful film, which might be exactly what audiences and voters are drawn to in the dying days of 2018. Despairing at the state of the world? Then perhaps you want to see Emily Blunt and Lin-Manuel Miranda singing and dancing around London more than another dark examination of the nature of humankind. Just saying. 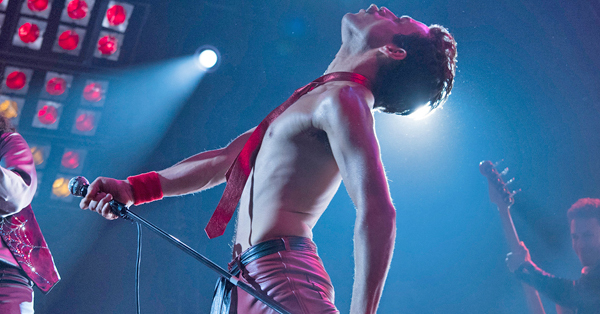 Director Rob Marshall seems to have tapped into something that’s hard to quantify yet wholly disarming, especially for adults. As Dame Angela Lansbury says towards the end of the film, most grownups “forget what it’s like… to be a child.” Don’t think that’s enough to convince voters? It’s the same kind of infectious optimism that La La Land inspired in Academy voters back in 2016. Looking for nomination sure bets? Look straight to below-the-line categories like costumes, make-up, visual effects, and production design. But you already knew that from the trailers. Having seen the film, we would add Best Editing and the sound categories to that list. One sequence that takes place on the surface of a porcelain bowl highlights the best elements of all of the aforementioned trades: careful sound mixing and effects seamlessly integrate the characters into a delicate ceramic and animated world, while Sandy Powell’s costumes for the sequence are a mix of materials and appear as a blend of soft fabrics and watercolor paints that would crumple upon touching. 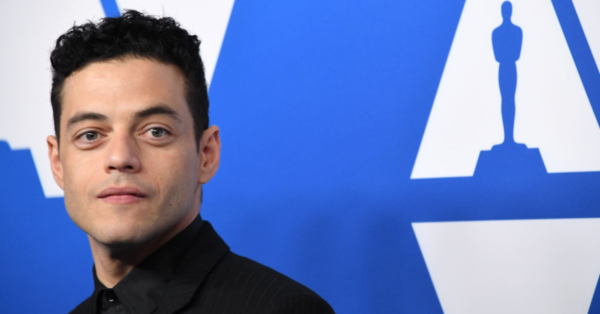 Powell could go up against her contemporary rival Colleen Atwood for Fantastic Beasts: The Crimes of Grindelwald, Black Panther costume designer Ruth E. Carter, and, in an interesting wrinkle, herself; Powell has a second bite at the Oscar apple with her equally impressive work on Yorgos Lanthimos’ The Favourite. To achieve the vivid 2-D animation sequences that are a particular highlight of the porcelain bowl scene, Marshall went to painstaking lengths. These days, Disney animators work primarily in the digital format — the studio’s last hand-drawn animation was back in 2004, long before most of the current crop of animators joined the company. 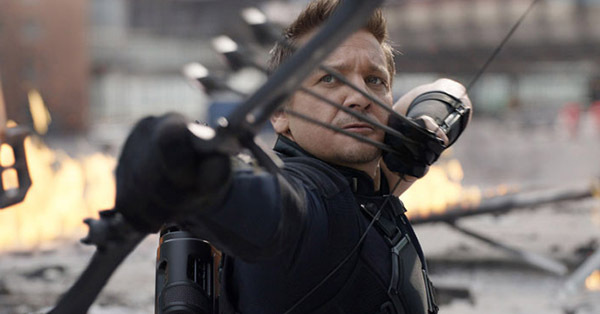 It required calling former animators out of retirement to achieve the signature mix of live action and 2-D animation, while implementing innovations for both formats. Marshall had to merge two animation mediums that were never intended to coexist; the results could earn the movie consideration in the effects categories. 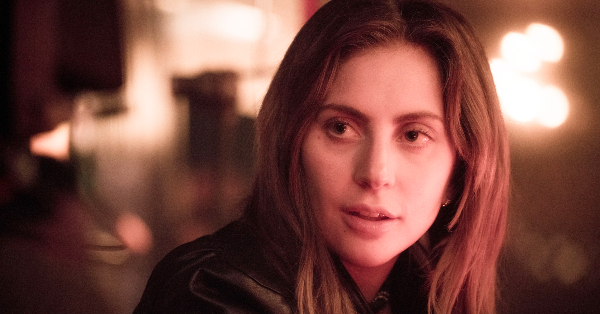 Lady Gaga and Bradley Cooper’s “Shallow” from A Star is Born has seemingly been a lock for the Best Original Song Oscar for months. A bona fide chart-topper that has been streamed over 10 million times since its September 27th release, it has long looked unstoppable. But last week “The Place Where Lost Things Go,” sung by Blunt, and “Trip a Little Light Fantastic,” sung by Miranda, were released, marking them as the two songs Disney seems to be backing for the category – and they may just cause an upset. For acting, it’s all down to Miranda and Blunt. They get the lion’s share of screen time and perform the narrative heavy lifting. At the Globes, Miranda has more than a decent shot of a nomination, with the categories being split between Comedy and Drama, but it’s unlikely he will prove a challenge to Christian Bale and Viggo Mortensen. Blunt fares slightly better in the Best Actress – Musical or Comedy race. It will likely be a three-way race between Blunt, Constance Wu for Crazy Rich Asians, and Olivia Colman for The Favourite, and while most think Colman is a shoo-in, Blunt has a history with the Hollywood Foreign Press Association that shouldn’t be dismissed (she is a five-time nominee and one-time winner). Even Mary Poppins herself would have a hard time magicking an Oscar nomination for Miranda, but Blunt has the pedigree and delivers a performance that may squeeze her into contention before the Academy announces its nominees. For Best Picture, things will likely come down to how many nominees we get. 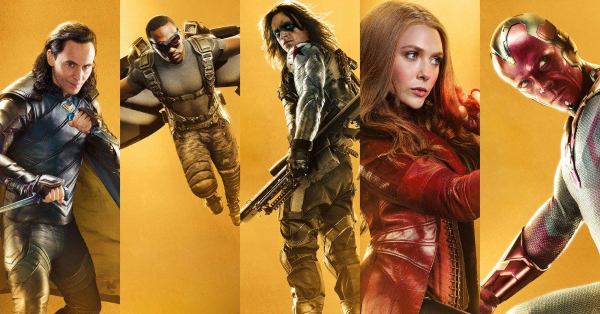 At least five percent of first-place votes must go to a particular film in order for it to contend for Best Picture as one of the final nominees. 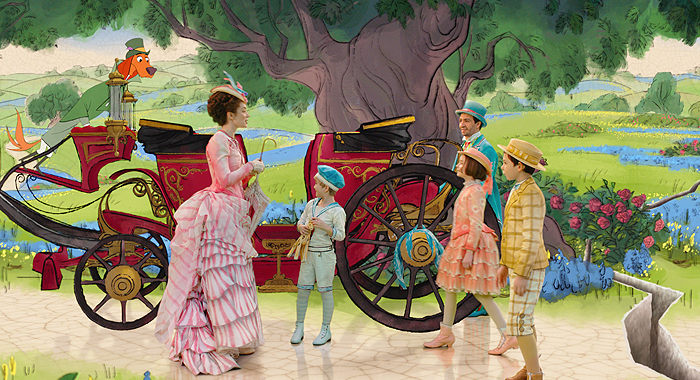 With the race still wide open, it’s not unreasonable to think the Academy could have a strong preference for more than five films; Mary Poppins Returns will stand a strong chance if the Best Picture field stretches to eight or ten nominees.